A giant former labourer from India who has become an international wrestling sensation is now a star in his homeland too. The Atlanta-based Dalip Singh Rana, who is from Himachal Pradesh, stands over 7ft tall and weighs nearly 200kg. 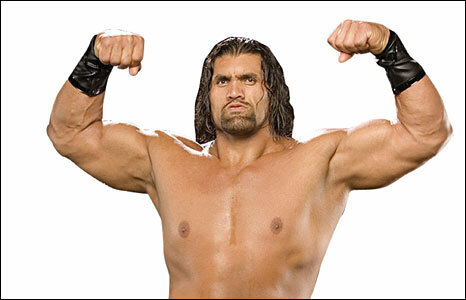 Nicknamed the "Great Khali", Rana is a top draw at the hugely popular World Wrestling Entertainment (WWE). With some Hollywood work under his belt, he is now looking at offers from Bollywood. Rana, 36, is now back in India to spend some time at home and shoot a documentary on his life. He is the first Indian to be signed up by WWE, and enjoys top billing in the famous American showbiz circus alongside fighters such as Hulk Hogan and The Rock. "Hailing from India, the Great Khali stands at an impressive 7ft 3in [2.21m] and weighs 420 pounds. This enormous monster has walked the jungles of India unafraid of pythons and wrestled White Bengal tigers," says the WWE website. "Legend states that the Punjabi Warrior has stared into the abyss and the earth trembled at his gaze." Rana laughs when reminded of this dizzy tribute. "Americans could not imagine someone from India in WWE. They are now actually having a lot of fun," he says. He briefly wrested the world champion's mantle in 2007 with a series of superlative performances at WWE. Two years ago, when the US government wanted to send WWE wrestlers to cheer soldiers in Iraq, Rana's name was also in the initial list. Once he knew he would not make it, he apparently prayed in front of a map of India in his living room. "He prayed for better luck next time. But God, otherwise, has been kind to him," says Amit Swami, a bodybuilder from the northern Indian state of Haryana who is also Rana's spokesman. Rana should have no complaints as his popularity is now soaring in his homeland, and he has been offered a chance to act in Bollywood films. He is no stranger to films. Like many WWE stars - such as The Rock, aka Dwayne Douglas Johnson - Rana has done a few odd Hollywood roles, including a 2005 film called The Longest Yard. On the set of another film, called Get Smart, the wrestler surprised Hollywood actor Steve Carell. "Literally, you shake his hand and you are shaking the inner part of his palm. He could put his hand over your entire head and crush you," Carell told a reporter later. "He's a very sweet guy, but he did not speak English really well. I don't even know if he was completely aware that he was doing a movie." Now Rana says he will be "choosy" about doing roles in Bollywood. Clearly, the wrestler has come a long way since he was breaking rocks on road building projects. In his spare time, he picked up two body building titles. When he was not working, women in his village of Dhirana would often call him to do what they call heavy duty work: lifting cattle from one barn to another. The turning point came when he and his friend, Swami, went with a group of admirers to Delhi's international airport to receive Dorian Yates, a top British bodybuilder. Rana's physique impressed Yates the moment he saw him. "He is India's man for WWF [as the WWE was called in those days]. This one will go places if he can maintain his physique," Swami quotes Yates telling him. Soon Rana was off to Japan to try his luck there. He spent a year performing some mock fights as "Giant Singh" and says he was duped by his agents. But eventually, he landed in the US and debuted as a professional wrestler in 2000. "It was tough, really tough reaching here," says Rana. His meeting with WWE officials was brief but the decision to enlist him in the show immediate. WWE scriptwriters racked their brains for an appropriate nickname: Rana first proposed Big Bhima, a character from the Indian epic Mahabharata, but the name did not find much appeal. "Giant Singh" also found no takers. Someone recommended Lord Shiva but it was rejected on fears that it might offend Indian sentiments. Rana then proposed the Indian Goddess, Kali, and spoke about her destructive powers. It clicked instantly. The rest is history. Rana says he is a vegetarian and abhors alcohol and tobacco. He says he lives a "simple life" with his homemaker wife Harminder Kaur . "I have no fancy villa or cars. I live in a simple home and do not have the money to order a customised car that would fit my size," he says. Back in India on a three-week-long holiday at his village and then a documentary shoot, he says he plans to spend a few more years with WWE. Until then, the "Great Khali" is going to soak in all the attention and fame now coming his way in the land of his birth. The writer is an editor with the Indian magazine Tehelka.